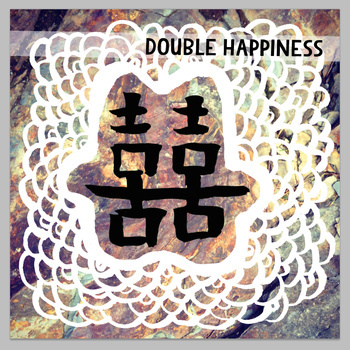 Double Happiness is a compilation of songs celebrating love, happiness and life and, in particular, the marriage of Jeff Thompson and Yuwen Huo. Life is short and goes on forever. Love is forever, and far too short. We are all one. Nothing ever ends. The beginning hasn't arrived. "And now we never have to eat ice cream by ourselves." This six song EP of original recordings is being released as a limited edition 8 inch lathe cut record of 125 copies artfully manufactured by the master cutter Mike Dixon of lathecuts.com, and featuring original art by the wonderful and talented Emily Timm of Bloomington, Indiana, who is a singer and multi-instrumentalist in several bands, including the Inky Skulls, Ghost Mice and Tooth Soup. The line up for this EP is pretty incredible. San Francisco's Magik*Magik Orchestra provides a stark yet lush version of the Mountain Goats' beautiful 02-75, with Minna Choi on vocals and piano, and featuring a sublime violin accompiment by Rob Moose of Antony & the Johnsons. Simon Joyner offers up the beautiful and soulful Only Gold Was Good Enough for you, a dreamy ode to love and a reluctant, melancholy farewell to loneliness. Finishing up side one is Franklin Bruno with Infant Changing Table, his gleeful and somehow romantic shout-out to spontaneous whoopie. Seminal experimental punk band Wckr Spgt starts off side two with a blast, and their rocking tune, Wedding Harmony Song, offers an incredible insight into love and deeper themes of togetherness and hope. Next up is indie pioneer John Vanderslice and his weird, fantastic, noise-pop love song to the City of San Francisco, Li Po Lounge. And winding everything up with beautiful awesomeness is lo-fi electronica Norwegian wunderband The Society of Poor Academics, and their perfect little pop piece Since That Day. Wow! Forty copies of this EP were given to guests of Jeff and Yuwen's wedding. The remaining copies were given to the recording artists and to friends of Gray Sky Micro Press. We all love each other. We all love you. Mastering by Nathaniel Sabatino, Loveland Studios.